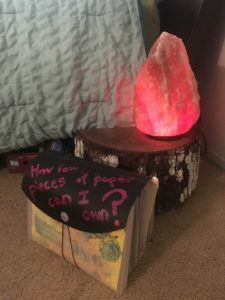 This is Part 2 of The Great Declutter series on how streamlining my backpack survival gear led me to downsizing the rest of my possessions by 2/3. 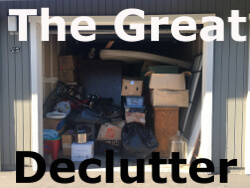 I utilized the Kondo Method for decluttering. First I put all of the same items together in a pile, like my 15 boxes of kitchen stuff! (I had no idea that I owned so much, which is the point of putting it into a pile.) Then I unwrapped everything and I held each bowl, mug, and baking sheet, and asked myself, “Does this give me joy?” If the answer was no, or if it was a duplicate, off it went to Goodwill. 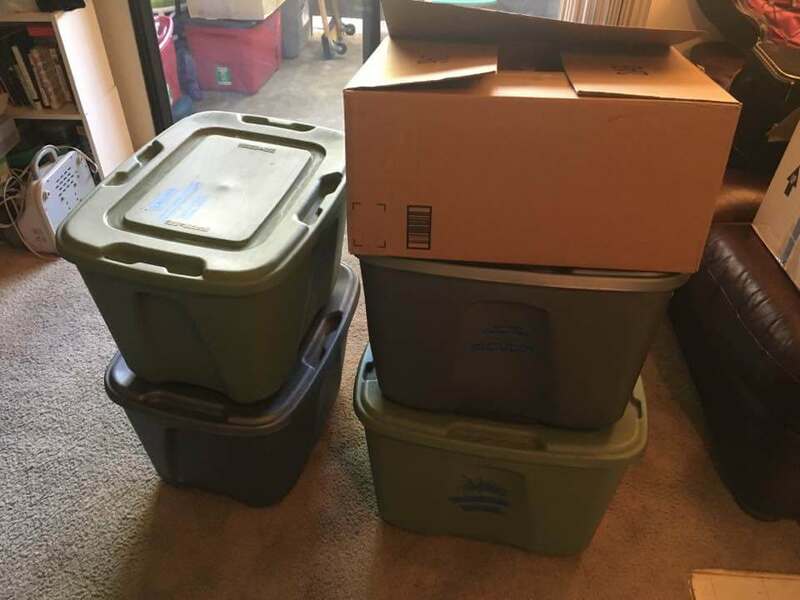 I downsized from 15 boxes to 5 boxes! First I got rid of four pairs of shoes that didn’t give me joy. (They were cute, but they gave me blisters.) 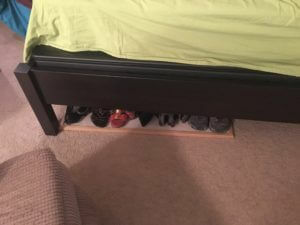 Storing shoes under the bed is inconvenient, so I fixed that by putting them on a bulletin board. 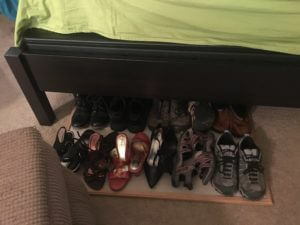 That way I can slide them out to make it easy to access the shoes in the back. Since I downsized my wardrobe from a bajillion to about 40 items (that’s excluding socks and underwear), I had a bunch of space in my closet. 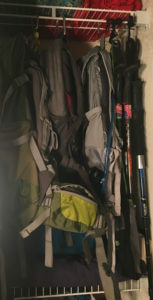 So I hung up my backpacks and trekking poles! It’s good to finally give them a home. I love how they look hanging from the carabiners, that I will open up the closet to just admire them. My brain couldn’t come up with a good reason to save most of them, so I shredded over 2/3 of the pile! 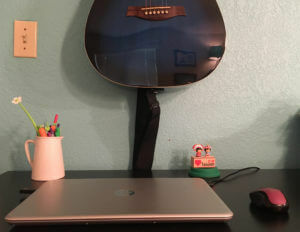 I’m no longer hoarding manuals, old pay stubs or taxes that are over ten years old. It gave me a lot of joy shredding those papers. Plus it is so much easier finding what I am looking for because they all fit inside of one accordion file folder! Paper is no longer my nemesis. I’m in charge. I kept misplacing my keys and my wallet because I don’t use the same bag every day. 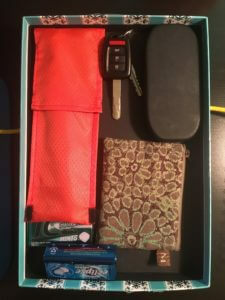 After decluttering the contents of my purse, I dedicated a cute shoe box lid to hold these items. When I get home, I take them out of my purse/backpack/pockets, thank them for their usefulness and let them rest in their black shoebox lid. And now head on over to Part 3!